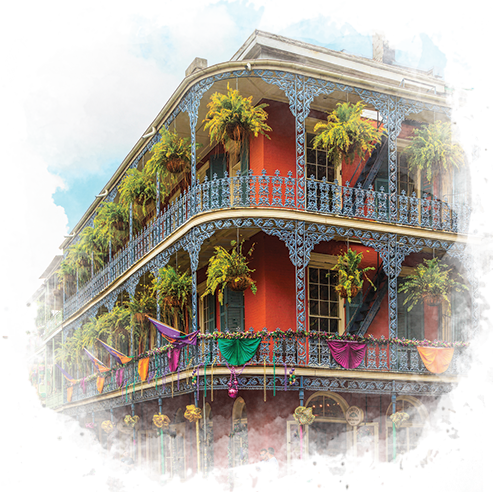 See the unique architecture and the lush, inviting courtyards as you stroll through the narrow streets, soaking up the charm and ambiance of America's most interesting city. New Orleans is such a fascinating city. Let us share our love of this unique city as we guide, entertain and educate you about all of the history, architecture, music, culture, cuisine and general attitude. Get a “local” perspective on where to go, what to see and do, and of course, where to eat! Founded in 1718, the French Quarter (Vieux Carre – meaning old square) was the original settlement of this 300-year-old city. Learn about the French and Spanish rule and the Louisiana Purchase. See the Cabildo, the Presbytere, the Pontalba Buildings, St. Louis Cathedral, Jackson Square, and the Old Ursuline Convent. Stroll by former residences of William Faulkner and Tennessee Williams; see Café du Monde and the Old French Market; learn about Creoles and Cajuns and their unique cuisines. Tours depart each day at 4:00 pm, from the Royal House Oyster Bar, 441 Royal St., and last for about two hours.Please arrive 15 minutes early for check-in.